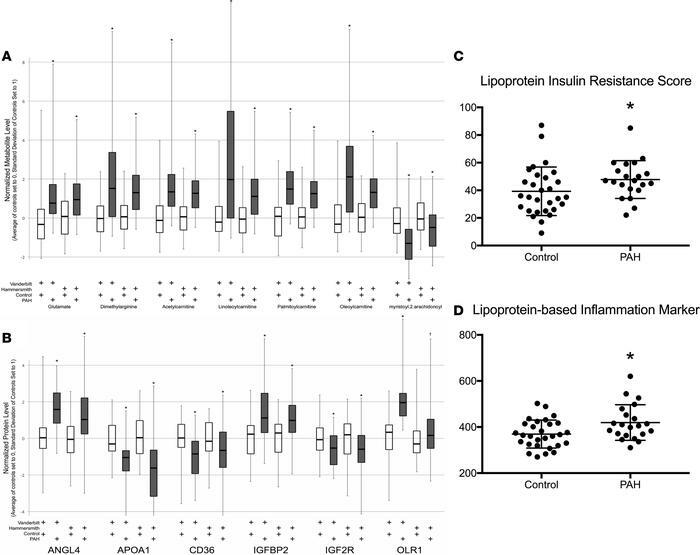 Replication of metabolomic and proteomic data with detailed analysis of lipoproteins in PAH patients and controls. (A) We validated selected metabolites in an international cohort with similar methodology. Our data replicated well in the Hammersmith cohort (n = 262 IPAH, 118 controls). *P < 0.0001 in all comparisons of PAH versus control. Each PAH was compared to the control from the same institution using a 2-tailed unpaired t test. (B) Proteomic data validation in the Hammersmith cohort. *P < 0.01, †P < 0.05. (C and D) Detailed analysis of plasma lipoproteins in PAH and controls and calculated (C) lipoprotein-based IR score and (D) lipoprotein-based inflammation core. Both were elevated in PAH compared with controls. Data presented as mean ± SD (n = 22 PAH, 28 controls). *P < 0.05 by unpaired 2-tailed t test (C and D).